Is it possible for humans to fulfil their needs without also destroying the environment? It’s a question we need to find an answer to soon, as the world’s poorer regions demand the same perks that come with development. On one hand, people need to consume some of a region’s resources so that those living there can drink clean water, grow nutritious food and get access to health services and education. But such consumption comes with unavoidable impacts. If these impacts increase beyond a region’s ability to continue to provide services such as water, pollination, soil stabilisation and climate regulation then the process of development can actually hinder rather than improve people’s welfare and well-being. Striking the right balance is tricky and requires a new way of defining places that are both environmentally safe and socially just. Over the past two years, working with an international group of scientists, we have developed such a definition of safe and just operating spaces. In doing so we have tackled the tension that often exists in low-income regions between raising standards of living and keeping environmental impacts within bounds that allow the environment to supply vital services. The findings of our research have been published this month in the journal Global Environmental Change. Such a formula must factor in everything humans need for themselves and all of their impact on the environment. While environmental impacts and human needs can be loosely grouped together, they don’t necessarily exert pressure in the same direction – think of how demand for more jobs differs from better health, for instance. This calls for a more rounded idea of a safe and just space, where human needs exert an outward pressure and environmental boundaries constrain humanity. Can we stay within the doughnut? Defining a safe and just space for humanity. If we wish to help people out of poverty then we must remain within the doughnut – the safe and just space – where people are above a social foundation in which they have what they need, but are not exceeding environmental ceilings by stressing nature beyond breaking point. In order for our approach to have practical use, we needed to show how to define both social foundations and environmental ceilings for a particular region. For defining social foundations, we built on the work of the economist Kate Raworth who synthesised nationally and internationally agreed minimum living standards. Meeting these minimums means moving into the “doughnut zone”. Now you see it, now you don’t. Air pollution in Beijing. But this zone is of course constrained by impact on nature and we propose four different types of environmental ceiling – cross any of the points below and you’ve escaped the doughnut and are into unsustainable territory. The red line is a limit that is deemed unacceptable to go beyond. A good example is air pollution. The Beijing skyline disappearing behind thick clouds of smog is producing iconic images of the environmental impacts of development in China. 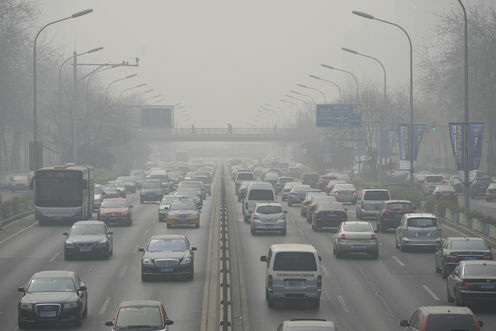 What is deemed an acceptable level of air pollution varies from country to country. The runaway can be explained with a cycling metaphor. Zooming downhill on a bike can be a thrilling experience. Unfortunately, fun can quickly turn to terror if you realise that your brakes are not slowing you down and in fact you are going faster and faster. Continual over-fishing of certain species on coral reefs can produce a series of rapidly unfolding disruptions to the entire system that quickly get out of hand and lead to the collapse of the reef. The tipping point is how close to a critical transition a system may be. A good example here is the sudden change in water quality in a lake that within weeks can go from a seemingly healthy system with clear water and teeming with fish, to green and clogged with suffocating algae. Moving the system back to the clear-water state can be as challenging as putting Humpty Dumpty back together again. The early warning signal can be best explained with another cycling metaphor. Your brakes may be able to handle very steep slopes but you may be unfortunate to experience a speed wobble where the front wheel begins to oscillate. These wobbles can feed back on themselves until the entire bike starts shaking from side to side. In such situations you slow down either gradually by applying the brakes or much more suddenly by getting thrown off the bike and sliding across the road. But there is hope that for some systems we may be able to detect these oscillations in time to be able to reduce our impacts. Consequently, detecting early warning signals themselves can be considered as a threshold that we should be wary of. Can we stay within the green zone? Four types of environmental ceiling. Dearing et al Global Environmental Change 2014. Two of our co-authors Rong Wang and Ke Zhang analysed environmental and socio-economic data to help define the social foundations and environmental ceilings for two case-study regions in China: Shucheng County and Erhai Lake. In both regions, intense agricultural development since 1960 has reduced poverty, but at significant environmental cost. 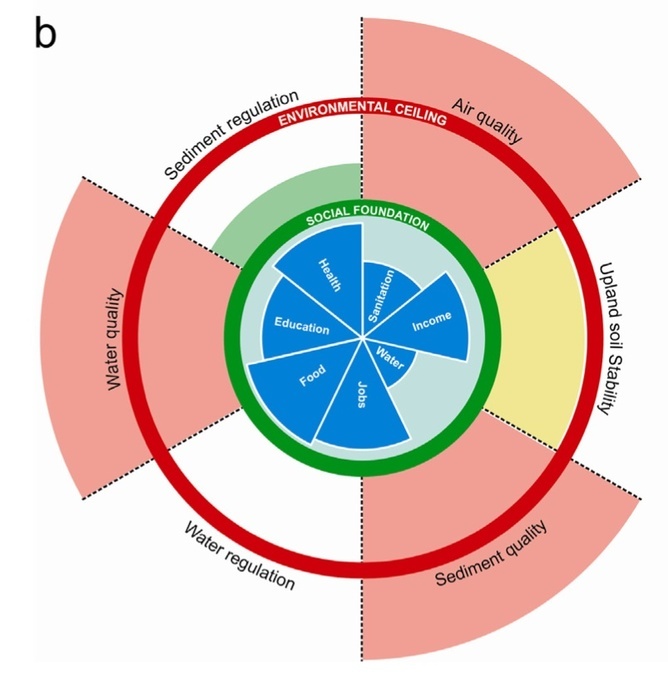 The regional doughnut for Shucheng County shows that water quality, air quality and sediment quality have breached the environmental ceiling while access to clean water, sanitation and education is well below the social foundation. The Shucheng County region in China is well outside any safe and just operating space. 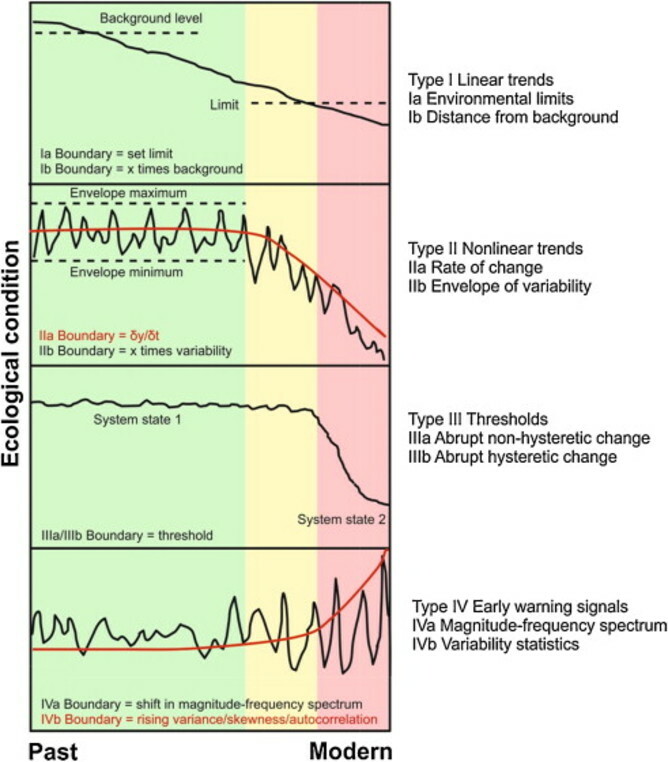 Dearing et al (2014) Global Environmental Change. Identifying such environmental ceilings is of little use if we simply power on past them. We hope that our integrated approach will lead to sustainable strategies that are based on a better understanding of the ecosystems that we all ultimately depend upon. We may not be able to completely avoid all environmental impacts associated with poverty alleviation – we cannot have our cake and eat it – but we can try to ensure as many people as possible enjoy living within the doughnut. John Dearing received funding from Ecosystem Services for Poverty Alleviation Programme (ESPA) (grant reference EIRG-2011-166). Peter Langdon receives funding from Ecosystem Services for Poverty Alleviation Programme (ESPA) (grant reference EIRG-2011-166). James Dyke does not work for, consult to, own shares in or receive funding from any company or organisation that would benefit from this article, and has no relevant affiliations.